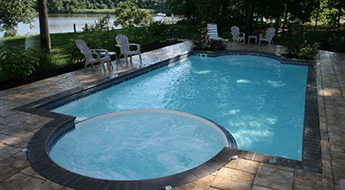 Inground pools add a whole new dimension of recreation and leisure to your family life. Properties across the GTA aren’t all large enough to accommodate a full sized inground pool (if yours isn’t, consider an above ground option!) But outdoor spaces that are large enough for an inground pool, will get a huge boost to quality of life and family leisure time. We believe leisure time together helps families grow stronger, and we want to make inground pools accessible to every family. Check out the design possibilities for pools in Toronto. Are All Inground Pools the Same? There was a time when an inground pool was an inground pool. But today, with streamlined manufacturing processes, things have changed. In addition to our completely installed pool program, we offer: Assisted installation program | Do-it-yourself program Each program is designed to help lower the overall cost of your inground pool, while giving you everything you need, when you need it. When you choose to invest in to and inground pool, you again the benefits of our mist affordable pricing on a product with renowned longevity.